Forkly, the food rating app from Brightkite founders Brady Becker and Martin May, just launched a major update dubbed “Forkly 2.0.” Along with a user interface overhaul which features a faster feed, bigger photos and an upgraded user profile design, the app update also includes improved menus and a “Discover” function to offer better, personalized recommendations. Hey, your Forkly “taste graph” just got useful! Although similar to competitors Foodspotting and Nosh, Forkly’s emphasis has been more on rating food items, not just taking pictures of them. Although the visual element gets a refresh with Forkly 2.0 (bigger photos! ), Forkly’s core function is still to help its users develop their own “taste graph” – that is, a personalized profile of what you like to eat based on your previous ratings (“like,” “love,” “not for me,” etc.). 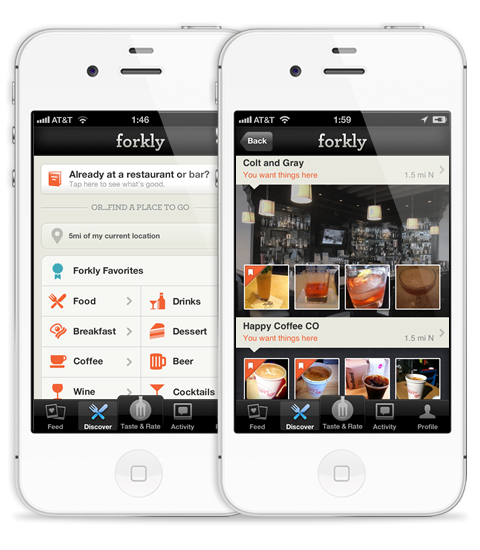 With Forkly 2.0, the app is pushing itself more into the foodie utility category than the social one. With the updated menu feature, for example, Forkly delves into its user ratings to show you the restaurant’s most popular items, the average ratings on a dish, and what your friends thought. It also reminds you of any “Wants” (bookmarked items) and “Hads” (things you’ve eaten before), to help you make more informed ordering choices. In addition, from the refreshed feed in Forkly 2.0, you can now double tap to add dishes to your Wants, and read comments inline. User profiles have been redesigned, too, with an increased focus on finding friends and earning “influence” points. But the biggest part to Forkly 2.0 is the new recommendations feature. In the Discover section, Forkly now gives you personalized dish recommendations based on category. This option reminds me somewhat of what Alfred was doing (pre-Google acquisition), in that it also let you tap on categories like “breakfast,” “lunch,” “coffee,” “dessert,” etc., to find dining options that fit your interests. Of course, how Alfred and Forkly generate those recommendations are different. Alfred rapidly built up a user’s taste graph via short quizzes, while Forkly is less in your face about its taste graph-generating function, the app’s “taste and rate” section. And of course, the way the data is analyzed on the backend is different, too, given that each company uses its own proprietary algorithms to make suggestions. Still, it’s these personalized dining recommendations that are the real benefit to using food rating/ranking/sharing apps like Forkly, and it’s also a feature that appeals to a wider demographic than just those who go around photographing their food and then tweeting or Facebooking about it. Forkly (ver. 2.0), now an Apple featured app for foodies, is available in the App Store here.